Ahead of a May referendum that would overturn Ireland’s ban on abortion, a group of prominent American pro-life leaders are urging Ireland’s Prime Minister to uphold his country’s eighth amendment. On Marcy 15, a letter signed by 17 notable pro-life leaders was hand delivered to Prime Minister Leo Varadkar a day before he is scheduled to visit the White House for its annual Saint Patrick’s Day festivities. “We are aware of the current debate in Ireland over abortion and the 8th Amendment and we believe that you, as the Prime Minister of Ireland, must be a voice for the most innocent and uphold the dignity and rights of each and every Irish citizen,” they wrote. The letter was signed by Jeanne Mancini, President of the March for Life; Marjorie Dannenfelser, President of the Susan B. Anthony List; Kristan Hawkins, Executive Director of Students for Life; and Catherine Glenn Foster, President of Americans United for Life, among others. “We have our own experience here in the U.S. with abortion and felt it is important to share this with you, as you visit to our great country. While America has long been a nation founded on freedom – “saoirse” in Irish – a dark cloud was brought over our nation on January 22nd, 1973, when the Supreme Court ruled in the case Roe v. Wade to legalize abortion in America,” they wrote. The referendum will take place in Ireland on May 25, and would allow for abortion during the first 12 weeks of pregnancy. 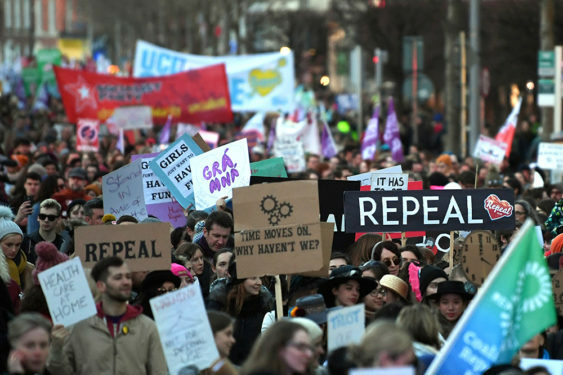 Early polling has suggested a close split on the question of repealing the amendment but with a majority of Irish citizens likely to vote in favor of it. The eighth amendment was signed into law in 1983 with 67 percent of the country voting in support of it at the time. According to pro-life leaders in the country, the amendment has saved over 100,000 lives. In June of last year, Varadkar said that his government would allow for a referendum on the amendment, and in January, after months of hedging, he announced his personal support of the repeal efforts. “Ireland has been a beacon of hope for America, that one day we too could have life-affirming laws that promote excellent healthcare for women and their children. You have the power to take a stand against the repeal of the 8th and protect women and their children from abortion,” the signees urged Varadkar. “Please do the right thing: Uphold the 8th Amendment and take a stand for life and for love,” they concluded.